With wood heat and no greedy electric appliances, this system runs a 10 cubic foot refrigerator, a desktop computer with efficient LCD monitor, a 27 inch Energy Star compliant color TV, a 1200 watt microwave oven, and assorted other lights and devices. In the summer when I produce more power than I normally use, I have enough energy to run a 5000 BTU Air Conditioner for the 1 or 2 hours a day that I need it when it gets over about 95 degrees F. The earth sheltered design (click the small pictures for more views) keeps it pretty cool most of the time. Usually, my ceiling fan is all that is required. I have been using between 60 & 80 KWH (KiloWattHours) of electricity per month. When I was hooked up to utility power and did not really know anything about conservation, my KWH usage was closer to 500 ! Look at your KWH usage on your electric bills and you will see the results that conservation and more efficient appliances can produce. A family of 4 would probably require 16 or more panels but conservation would still be part of the equation. 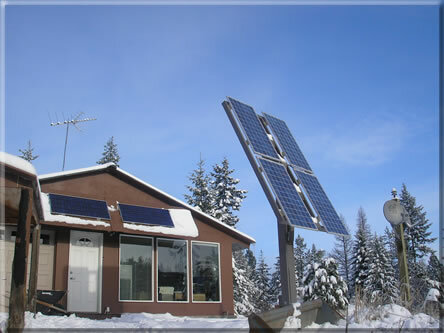 Check out About Solar Power for some examples of larger system costs. Also the System Sizing Estimator can calculate the number of solar panels and batteries needed for a wide range of configuations using simple one click choices. UPDATE: The trees casting shadows on the house mounted solar panels (which is a no-no) have since been cut down and the panels remounted on the seasonally adjustable mount shown on the left. This has increased output over 25% with adjustments 4 times per year. Since the trees were cut down, I later bought 2 more panels and mounted them back on the house since I still had the wiring in place. 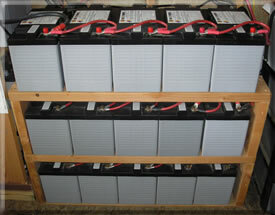 With a total of 6 solar panels and 15 AGM 105 AmpHour batteries I have plenty of ! In eastern Washington state, from about mid February thru about mid November I receive more than enough power from the sun. During the worst winter months (Dec-Jan) I run a generator for 45-60 minutes a day on overcast days to bulk charge the batteries. If I was connected to the utility grid, I could actually sell power back to the utility company during the peak summer power production months. Check out the Solar Radiation chart to get an idea of the amount of sunshine you could expect for your area. 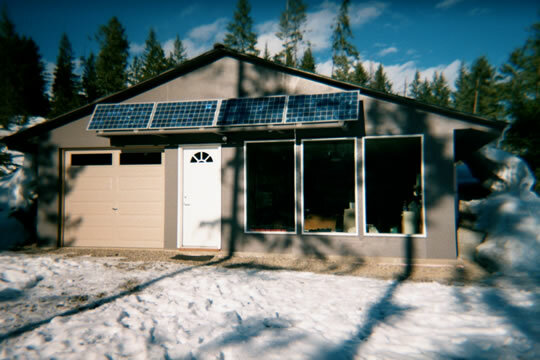 The cost for this system including a 7000 Watt electric start AC Generator, the new solar array mount, and the added solar panels & batteries comes to about $10,000 but could have been set up with less expensive components for around $6,500. That may sound like a lot of money but... NO electric bills! And energy independence! Here is a full view of the battery bank. These are 12 volt 105 AmpHour AGM (absorbent glass mat) lead acid batteries designed for alternative energy applications, all wired in parallel. With 1575 total AmpHour capacity and using 125 to 200 AmpHours per day, I could run for quite a few days. However, lead acid batteries like to be fully charged so I usually don't use more than 300 to 350 AmpHours before I recharge. This is known as shallow cycling and will greatly increase battery life. With this technique I expect to get 10 years or more from my batteries. On overcast days with little solar energy, I can run the generator for an hour or so and bring the battery bank pretty close to full. I wait for the sun to top them off. This is the original installation of all the components in the temporary power center. Shown is the AC breaker panel, system monitor, charge controller, 12 volts DC power fuse blocks, inverter, and main 250 amp circuit breaker. Eventually I plan to locate all the equipment elsewhere and use remote control panels and monitor displays only. 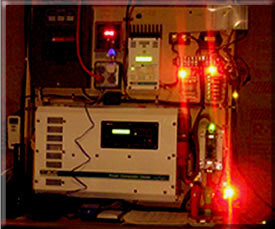 Although I am used to it now, the inverter does buzz a little when it operates.